I love energy bites. They are jam packed with wholesome ingredients and give you a burst of energy just when you need it. These delicious Blueberry Energy Bites have a tasty icing drizzle for a bit of extra sweetness. They are great for a fast breakfast, or as a nutritious snack. I also love using these as sweet easy appetizers. I love making healthy energy bites. They are so simple to make and make a great pick me up. See my almond butter energy balls for another tasty recipe..
For this easy recipe, just mix up a bunch of your favorite ingredients in a big bowl and form them into balls. Once they have set, a quick drizzle of a yogurt sugar icing gets added and they are done! Also be sure to check out my 80 calorie oatmeal peanut butter balls and these 88 calorie chocolate peanut butter energy bites. They taste amazing too. 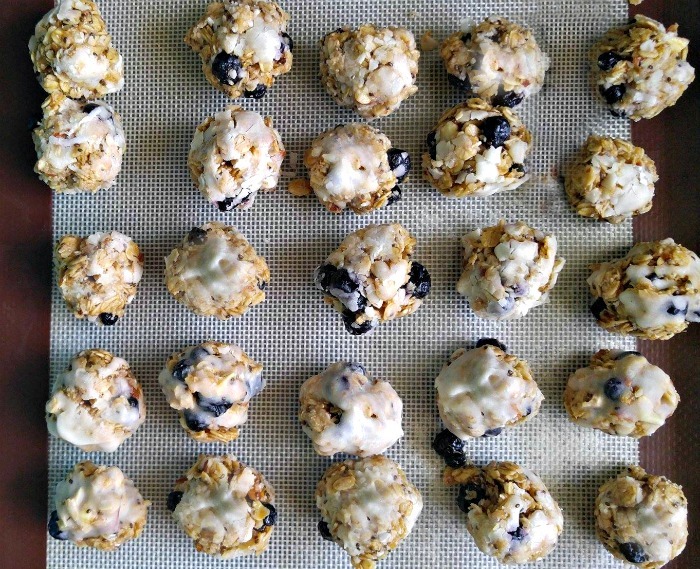 Here’s how to make these Blueberry Energy Bites. To make everything stick together, I used reduced fat peanut butter, honey and some vanilla extract. Something’s got to stick it all together, right? Heat the peanut butter and honey in the microwave and add it to the mixture. Then fold in the blueberries. The mixture will be very sticky. Use a small cookie scoop to get about 2 tablespoons of the mixture and form it into balls. I got about 40 bites out of my recipe. Making the icing is quick and easy. Just combine some of your favorite yogurt with confectioner’s sugar and vanilla extract. The mixture should be slightly thin. Add it to an icing bag and drizzle lightly over the top of the energy bites. I ended up with 40 bite sized balls. Allow the icing and balls to set until the icing is firm. Let’s take a bite of these energy balls! 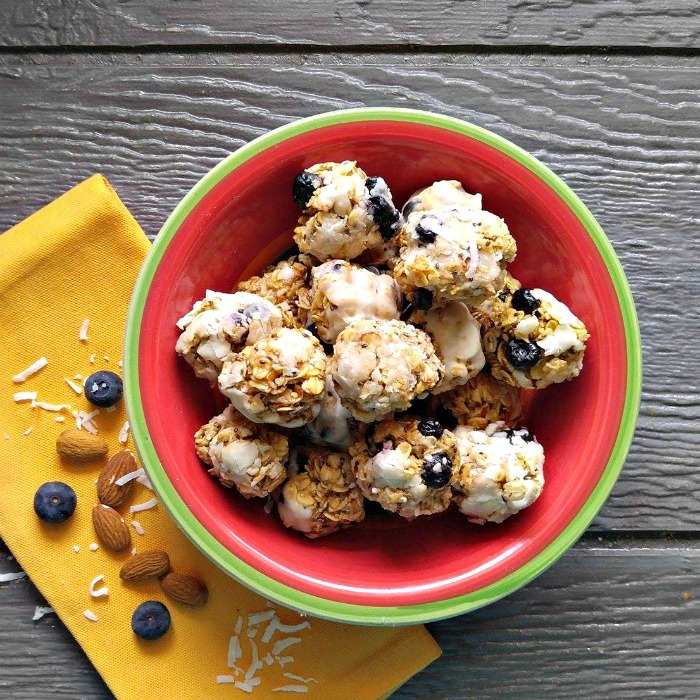 The Blueberry Energy Bites are chewy and wholesome with a sweet glaze that gives them a decadent taste. SO YUM! 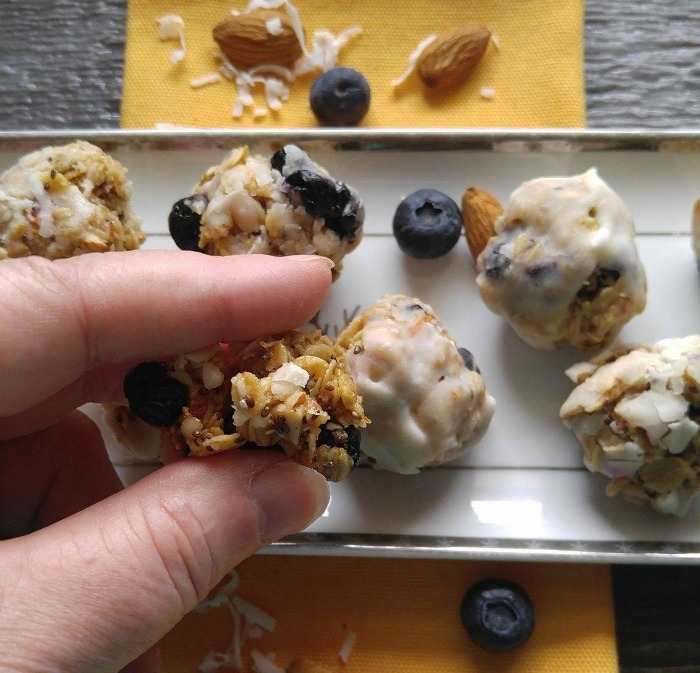 The energy bites make the perfect after workout snack. Or put some in a zip lock bag and keep them in your office for a quick boost of energy in the afternoon. 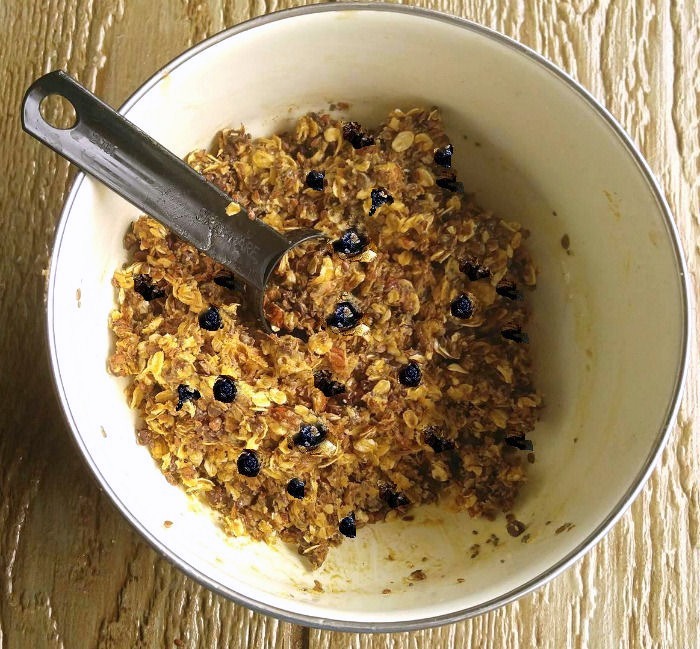 See how I used a similar mixture to make home made granola bars with the same icing. 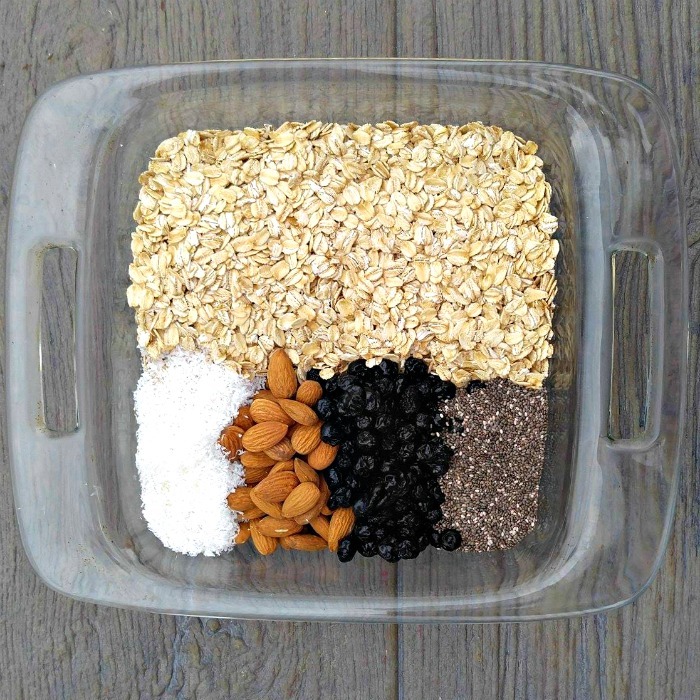 Also be sure to check out this Whole30 Breakfast bowl. For more healthy cooking ideas, have a look at these sweet potato energy balls and these lemon coconut energy bites. 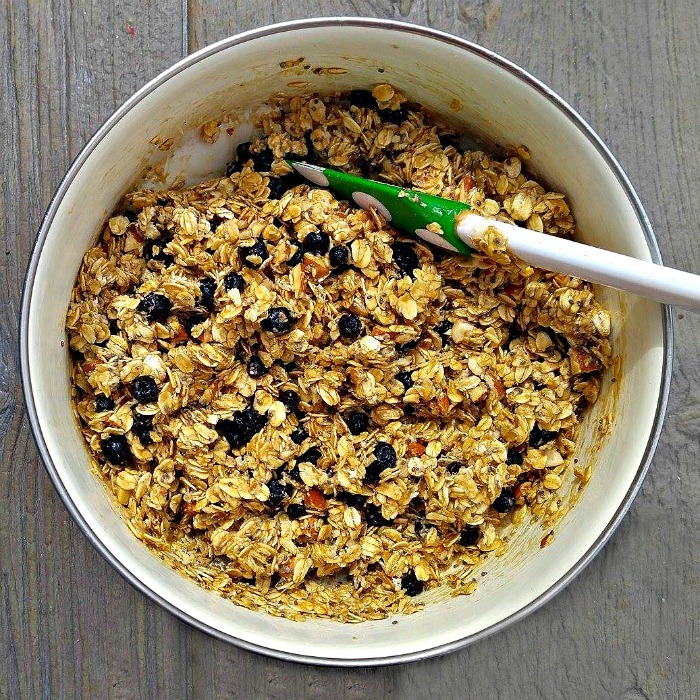 In a large bowl combine the rolled oats, coconut, almonds, chia seeds and sea salt. Mix well. Heat the peanut butter and honey in the microwave for about 30 seconds until it mixes well and can be poured. Add the vanilla extract and stir well. 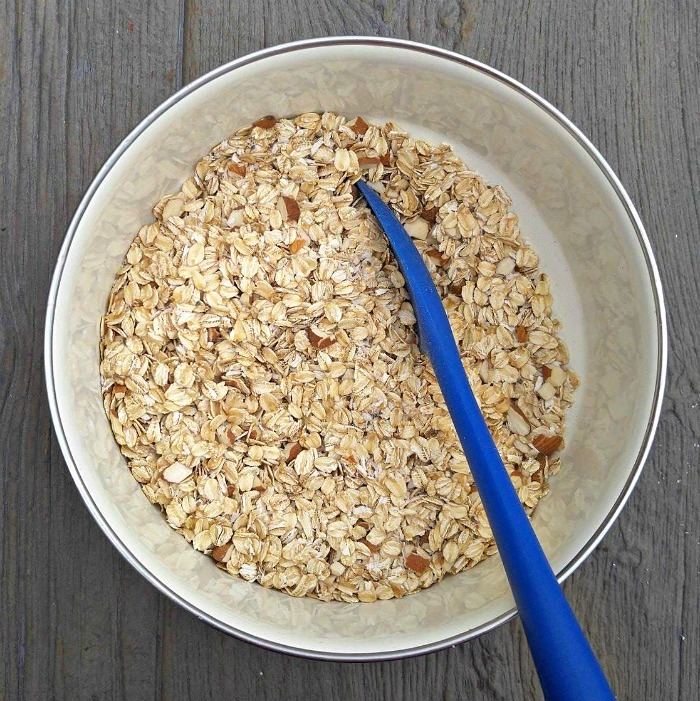 Pour the peanut butter and honey mixture over the rolled oats mixture and mix until it is well combined. Gently fold in the dried blueberries. Use a small cookie scoop and form the mixture into 40 balls. Place in the fridge to set for about an hour. To make the icing coating, place the yogurt an honey in a microwave safe bowl. Heat slightly and mix well. Add to a mixing bowl and mix in the confectioner's sugar until the icing is creamy but slightly runny. Place the icing mixture into an icing bag, snip off the tip and drizzle it over the balls. All to set on the counter until the icing is firm. Store in an airtight container. Wow, This is cool looking. I think this very powerful and yummy taste….